LUNG AID helps support horses' immune systems, respiratory health, oxygen utilization and promotes normal recovery from seasonal allergies. LUNG AID supports oxygen utilization and helps promote stamina. A horse that breathes better performs better. This product helps enhance exercise tolerance, normal cardiac output and supports normal integrity, function and circulation of the lungs while strengthening the walls of the capillaries in the lungs. Environmental challenges and seasonal allergies can overwhelm a horse’s natural defenses, leading to health concerns. 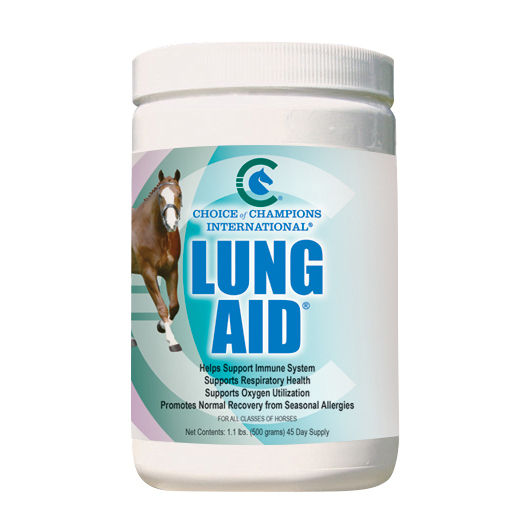 LUNG AID supports a horse’s respiratory system and promotes the normal recovery process from seasonal allergies. A healthy horse’s respiratory track protects him from irritants such as mold, dust and pollen. LUNG AID supplies the body’s tissues with oxygen and copes with the increased demand for oxygen when exercising.